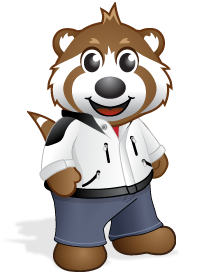 Pandanda - Henry's Blog: Plan Your Week in Pandanda! Plan Your Week in Pandanda! Check out this picture Mod Muzester sent me from Pink Panic Day last Thursday. You all really did turn the Purple Door into the Pink Door! That's awesome! This may be the last week of July, but the summer fun isn't over yet! Tomorrow is Wacky Outfit Day. This is your chance to mix and match all of the craziest things in your closet to come up with the silliest outfit possible! Read my blog tomorrow to find out more. Make sure to mark your calendars for another super Free Elite Member Day on Saturday. It's a chance for everyone to experience what it is like to be an Elite Member for 24 hours! And check out the new Pandanda Poll over on the right. What is your favorite thing to do in Pandanda? You can pick more than one answer, so make sure to get your votes in!